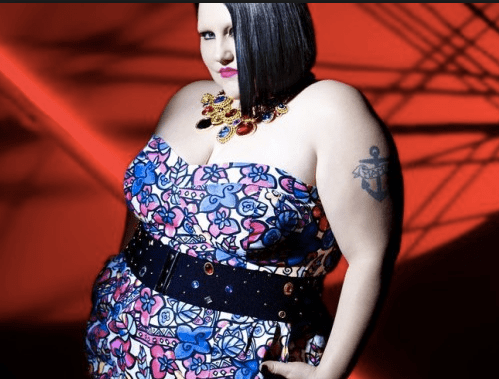 Whaddya know, another Beth Ditto post. When I realized that the theme for our Ahead of the Curve Blogging Collective’s, May post was Garden Party I knew just what I wanted to wear. I have had this dress for about a year, it is the Beth Ditto Stain Glass Prom Dress from her 2009 Evans collection, and of course I bought it on ebay. I fell in love with it and looked for it for a long time before I found it. It has never seemed very “promish” to me since it is a floral, cotton sundress, but I expect to wear it a lot in the near future. I may try it with a belt. I love that it has pockets. After I saw this photo of Beth in this dress I decided I had to have a statement necklace, and of course I had to make it myself? But of course I got carried away, and I made it a little larger than was necessary, but what fun I had. I call it assemblage. 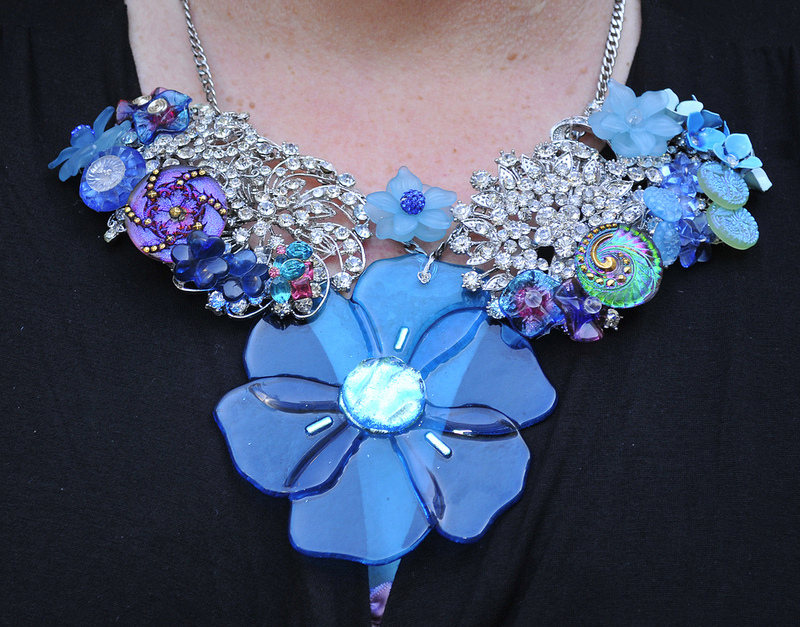 I started with four inexpensive clear rhinestone brooches and just kept adding glass buttons and beads from Etsy, and from my stash of old jewelry from my mother-in-law and my mom, onto the heavy chain I had in my jewelry box. The earrings are from the 80s. I think I paid $6 for them on Etsy also. 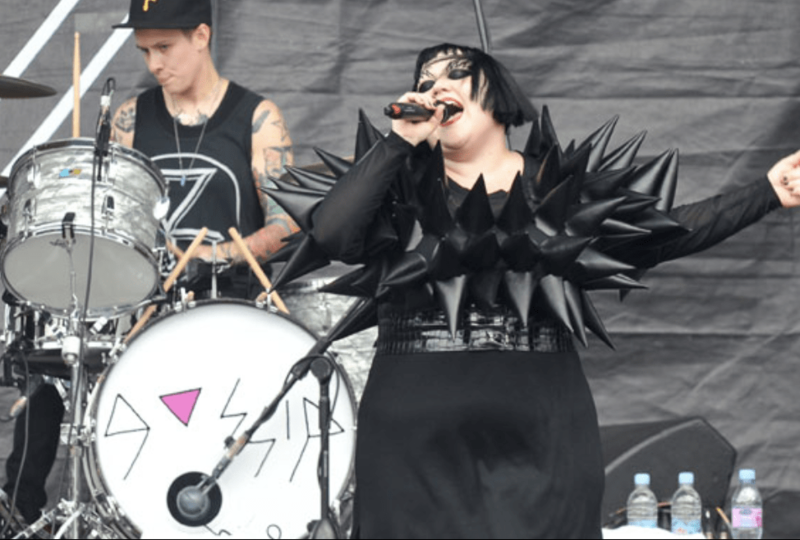 This is the end of my Beth Ditto stash, time to look for more. 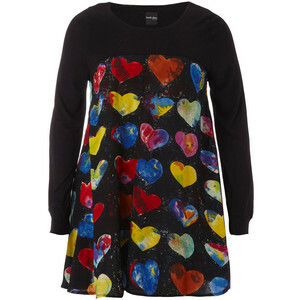 I would love to have this sweater, also from the 2009 collection, but I have never seen it on ebay. Maybe they did not make very many. I am sure someone has one in a closet somewhere, and they never wear it, and it is just sitting there waiting for them to sell it to me. Don’t stop here! Click HERE to check out all the chic, smart ways other bloggers from AHEAD OF THE CURVE interpreted this month’s theme, Garden Party. Beth Ditto in My Mailbox! 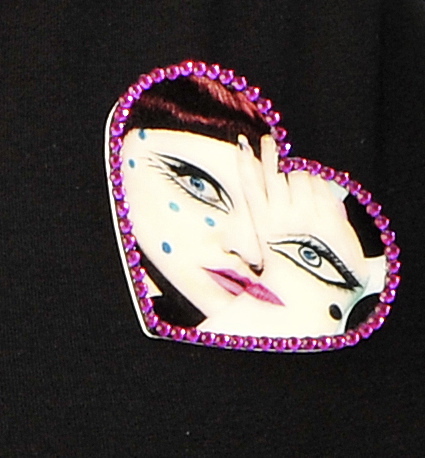 I know y’all have heard before that Beth Ditto is my fatshion hero, so imagine my glee and surprise when this lovely brooch showed up unexpectedly in my mail box the other day. 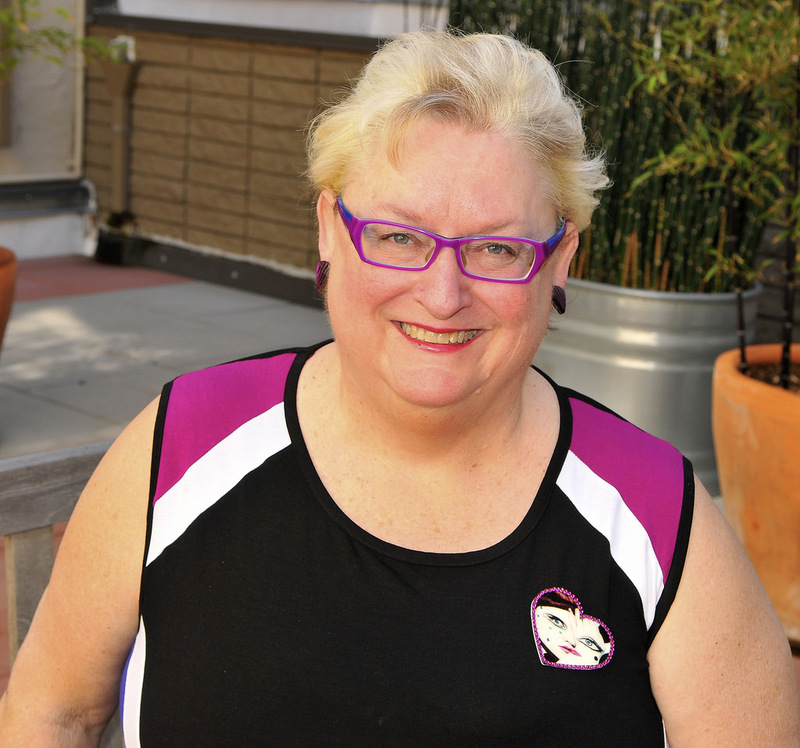 It was a gift from my fellow “Ahead of the Curve” blogger, Christina “Stina” Scott, owner of Every Day is Like Halloween, and blogger extraordinaire of Fatshion Peepshow. Thanks Stina, I love it and I will wear it often. This is a fat girl’s version of vintage. 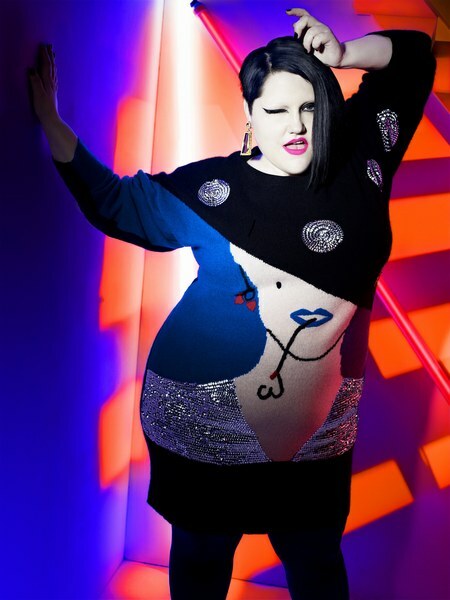 I know you know I love Beth Ditto, she is my fatshion hero, and she’s everywhere on my blog as you can see HERE! 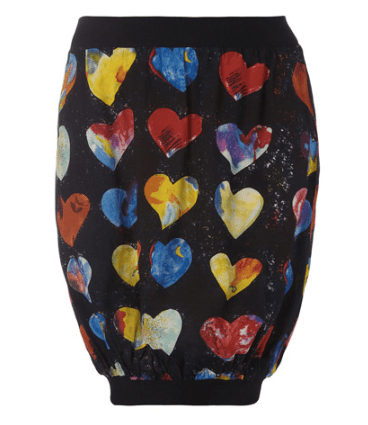 I bought this skirt (that I am wearing as a top) about a year ago on EBAY. There is almost always something from her Evans line, but it is a bubble skirt, and I just could not make it work for me. 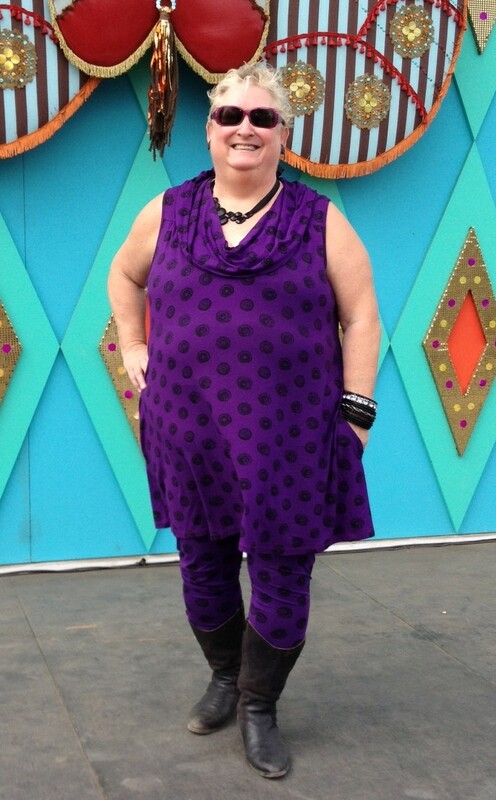 I wore Beth Ditto last Valentine’s Day, and decided I would just fool around until I found a look that I liked. I also wore my first pair of knee high boots, you can read about those HERE. The theme for our blogging collective, Ahead of the Curve is “Red Hot”, just in time for Valentine’s Day. 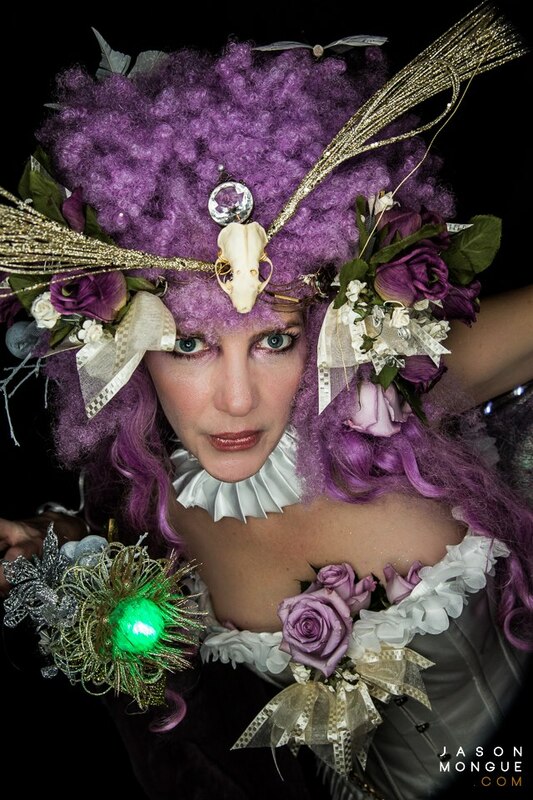 You can find more information about Ahead of the Curve or our past topics here, http://www.aheadofthecurvebloggers.com. 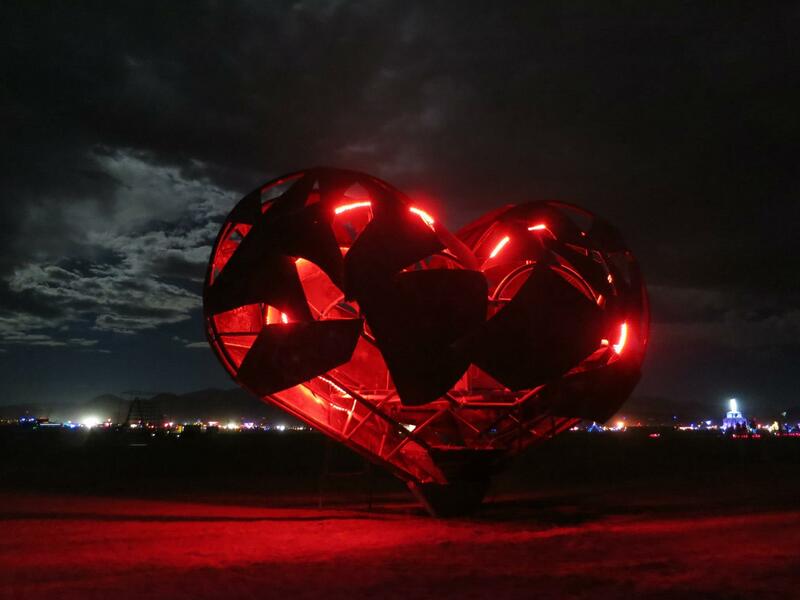 Sometimes you must wonder, what is it that makes Burning Man Project and Burning Man so important to me, and what do I do for them? Well, they make my life richer, fuller and more fun. Currently for Burning Man Project I am a volunteer and the Social Media Coordinator, that means that I take photos, interact on Facebook and Tweet for them and update events, etc. on their website. 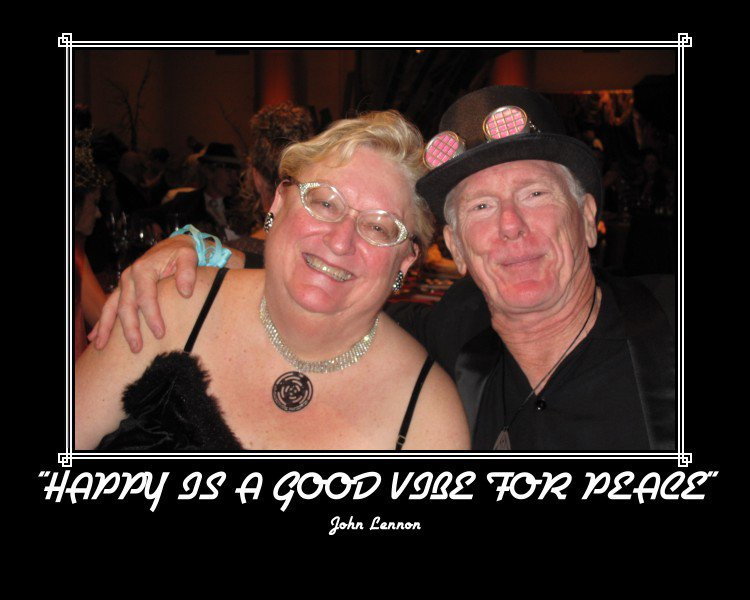 On Valentine’s Day, February 14th, 2013, Burning Man Project joined Glide in San Francisco by helping serve dinner to over 700 guests on this happiest of hearts day! 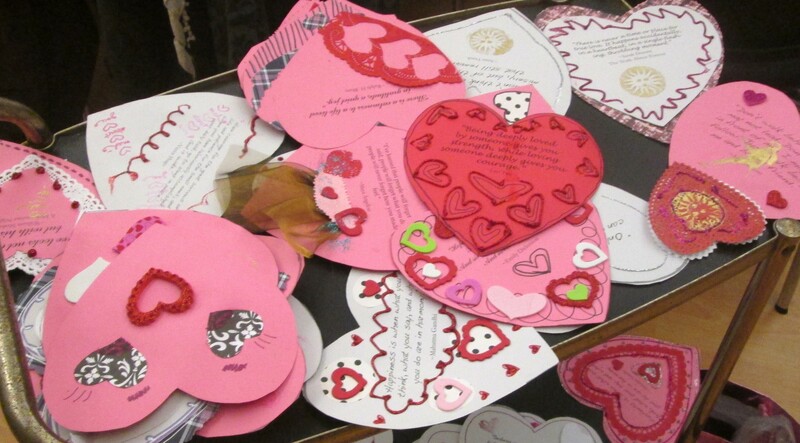 Not only did we help serve the meal, but leading up to it, we crafted the LOVEliest valentines to give to Glide dinner guests. The outfit above is what I wore to help make Valentine Card. Dress: Asos Curve (US Size 22) bubble Skater Dress, this has become my go-to dress for cropped sweaters and tights. It is comfy and fun. Leggings: One Stop Plus Size 3X (I wear a size 26-28 generally). I cannot really recommend metallic leggings. No matter what size you get they bunch at the knee and the ankle immediately and I think the bunching looks worse than in other colors. Boots: Torrid, Size 10, for more information click here. 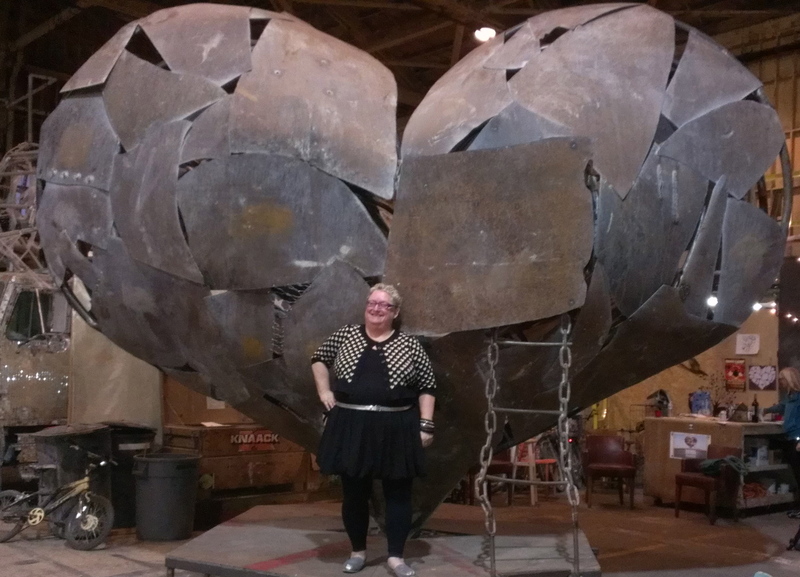 Then on Sunday we went out to our friend Katy Boynton‘s studio to celebrate Heartfullness, and of course I had to wear my valentine outfit again. Shoes: Torrid Size 10, I wish they had had 10 pair, I would have bought them all, they were $10 in the store Thanksgiving weekend. 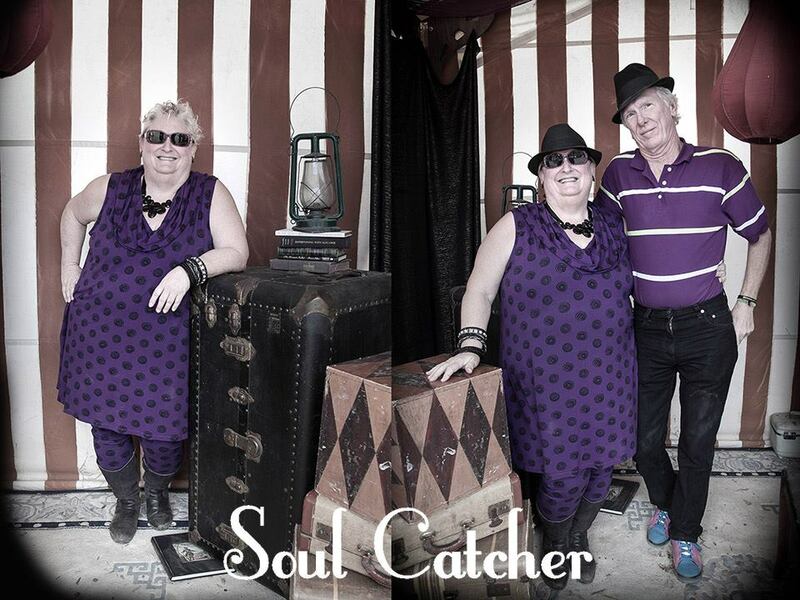 And this is what Heartfullness looked like at Burning Man. 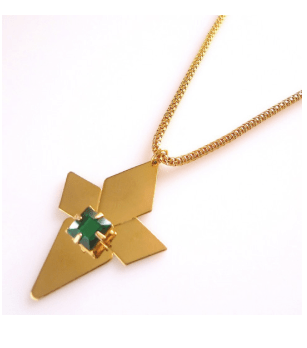 And there is Heartfullness necklace, I love mine. 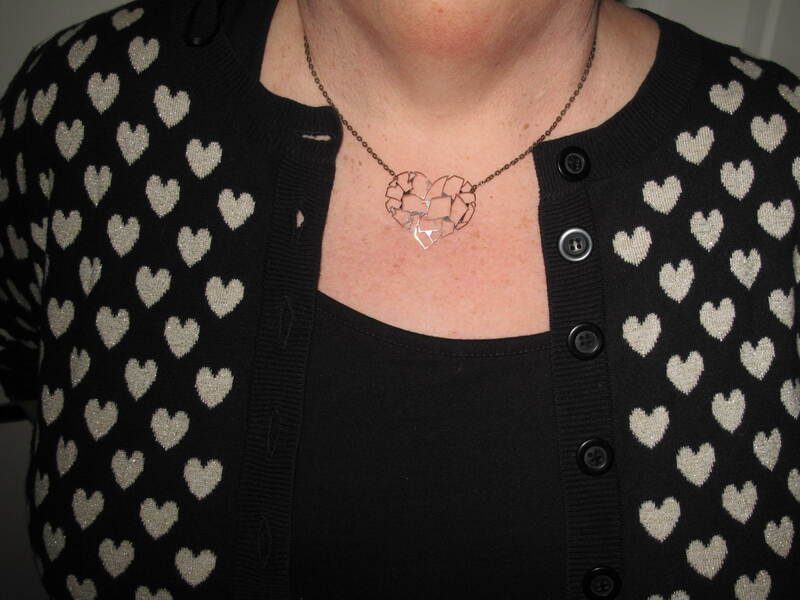 In this photo you can almost see the silver metallic thread running throughout the hearts in the sweater.